My desk is usually much messier than this with stacks of printouts, magazines, pages ripped out of magazines and newspapers. Just before I got the idea for this feature, I'd cleaned up. Don't think I'm normally this tidy. (The Ksy glances around as she begins this reply.) Oh my! My workspace, at present, isn't fit for company. lol I'll send one later -- right now I'm in the midst of redecorating my place and rearranging my life!!!! What a lovely view you have Ronni! What a great idea to do this! Thanks- this will be fun. I'm already envious of your space. BTW: If readers look closely I have left my credit card visible. Ah, but what nice colors, a view, and a lovely desk too. Thanks for starting this. I truly like projects like this one, and I will add a link to this on my blog. You leave me smiling. What a delightful space you have. I just noticed that I have a mug that is almost exactly the same as yours. It used to sit on my desk with pens inside. A very close friend bought it for me from Israel almost 18 years ago. It is hand painted Armenian pottery. Nicole: Ollie the cat can often be found in a windowsill watching the birds and squirrels and people going by. But I suppose he was busy with something else when I took this photo. What a wonderful spot. I can imagine that at times the books and papers are helter skelter. I wonder if you have to close the shades at times in order to concentrate. I think my mind would wander on such a beautiful day...with a wonderful view. This is a great idea. Matty: This is Portland, Maine. There's not much activity out there aside from morning squirrels, cats and birds; it tapers off by about 9AM. In fact, I saw more people in Greenwich Village walking to the deli and back than I see on my street in an entire day. But I do need to close the blinds in the afternoon when the sun comes around and makes it impossible to see the computer screen. This desk is very discouraging. Even if I cleaned all morning, mine will never look like that! I'll shoot it later today but after looking at yours all I can think of is the day my mom went over to visit my (very organized) Girl Scout leader. They went into her garage to get something and, as my mom said, "You could eat off the floor." Then, she related, "I got so discouraged I went out and had an ice cream cone!" Well Ronni thank God for Weight Watchers or I'd be on my way to Hagen Daas right now! Maybe I should ask for my picture back...lol... my space looks trashed after looking at yours. I just love this feature, Ronni, and it has given me a lot of food for thought. I LOVE my workspace at work because the space is large and wide open. My home space, which I'll post another time, is in a cramped corner of my bedroom which is not ideal. I moved it there when my grandson moved in. He's gone and your feature has given me some incentive to replan my work area. I love all your windows! Oh Ronni, how clean you look! Funny comments, too. Once I had a post that invited folks to share what was "outside their window" where they computed--similar but not perhaps as revealing as this! Didn't know you had this feature until today's blog. Maybe it'll all turn into a coffee table book! As a new reader, I was just happy to find you! Now I'm inspired to clean up my office - a chore I've been putting off for at least ... well, too long. A window. How nice to have a window to look out! Up until this March I had a view out of my dining room window for many years in Portland, OR, to gaze out of as I wrote. Now, in Michigan, I don't have a view but I have a lovely desk our neighbors gave to us as a going-away present with shelves where I keep many beloved objects displayed. I assembled the desk myself, which also makes it special to me just because I 'built' it with my own hands! Like MissKris, I would like to know more about moving from Portland, Maine to Lake Oswego, Oregon. I went from Portland, Me. to Seattle and it was huge. I sometimes imagine moving to Portland, Or., especially because of some decisions the Seattle movers and shakers have made. I'll be looking forward to your stories on oregon. The hallmark of a writer is all the clutter surrounding the Event of Writing. Ditto for reading. 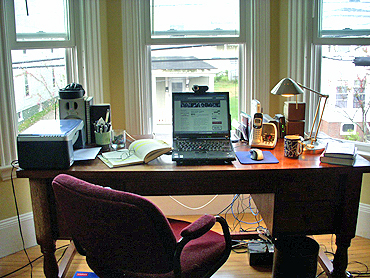 I always like seeing what the writer's view is as he or she writes and it's nice you have a window. A room with a view! Good for you.